Shimmerz Paints: Shimmerz and white Prima flowers . . . a perfect match!! Shimmerz and white Prima flowers . . . a perfect match!! Just a little share for the day . . . I first sprayed the flower with Sea Foam Spritz. Then I dipped the edges of the petals in the excess spray (I always place my flower on wax paper or a plastic bag so that the excess Spritz doesn't get absorbed). 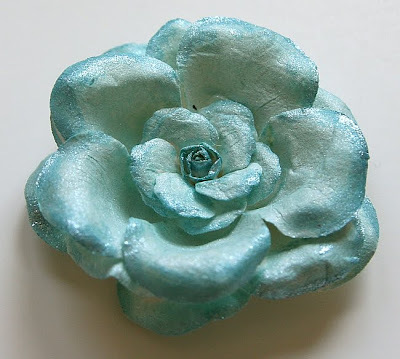 Finally, I painted the edges of the petals with Tickle-Me-Turquoise Shimmerz paint for a little extra sparkle and contrast. What I love about Spritz and Shimmerz paints is that the colors are so vibrant, yet they are not too overpowering. It's just the perfect amount of color and shimmer! Awesome flower! I have used Shimmerz and the Spritz on many flowers, love it! Wow Beautiful flowers and I must invest in some Shimmerz. don't you just love all of the cool things you can do with shimmerz and white items? this page is very nice! 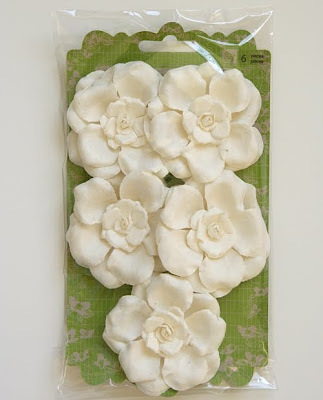 where do you find these Prima flowers?